The name you are looking for is. 59th Training Regt R.A.C. Deerbolt Camp. Barnard Castle. I spent 6 months there training in 1947. Remember the name of the Railway Station? " Broomilaw Halt"
Long since gone through Dr Beeching. In an answer to Mr. Palmer, the 59th Tr. Reg. RAC, Camp was named Barford Camp, on the right hand side, about 4+ miles, NW, out from Barney. Between Barford Camp and Barney on the right of the road was the 61st Tr. Reg. RAC Camp, I believe called Aliwal Camp, where they trained on Shermans. South of Barney and over the river was the 54th Tr. Reg. RAC at Deerbolt Camp, training on Cromwells and Comets. 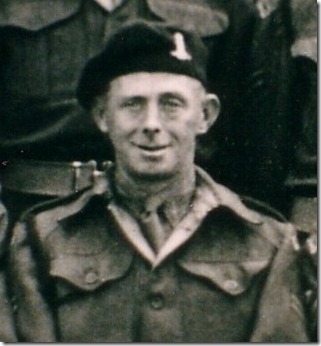 I was posted from the Reconnaissance Corps at Waitwith Lines at Catterick in early 1945 to the 59th. Here I was a Daimler and Staghound Armoured Car Driving Instructor, (could I have trained you?) until 1947. I was posted to my allocated Regiment, the 11th Hussars PAO, then stationed in Delmenhorst, Westphalia, Germany. Is this of any use to you? Contact me if you need to on norman.johnston@ntlworld.com. Greetings from a very old “SWEAT” and hoping you are well, how old are you now? Norman. I must apologise, since this correspondence has jogged my ancient memory, I have remembered that it was Streatlam Camp, not Aliwal Camp of the 61st Tr. Reg. All the time that I was in the Barford Camp, the names of Westwick and Humbleton Camps, were unknown to me, as is the Stainton Grove Military Camp. As a frequent Duty Driver, I drove Officers to and from the 61st and the 54th and also to and from Raby Castle, where there was an Officers Club. When in Barnard Castle on a weekend, I occasionally met with squaddies from the 61st and the 54th, but never from those other Camps. 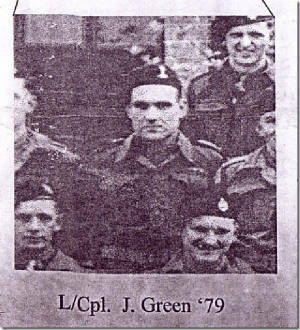 My only memory that I remember, is that around 1946-47, that a Royal Tank Regiment was in Training over that way, because volunteers to join them, were being asked for in Barford Camp, I also remember some of us walking to and from the Black Swan (The Dirty Duck) Inn in Staindrop. Other memories are coming back. We would leave Barford and drive the Daimler A/Cars to Warcop Camp, near Appleby-in-Teesdale, for 2 pdr Cannon and the BESA. 7.92 Co-Axial Machine-Gun, Firing Practice on the Ranges there. I also remember with great pleasure, my many visits to the Bowes Museum, a magnificent Building. If there is anything else that I can help with, please ask me, regards, Norman Johnston. The 59th Training Regiment was at at Barford Camp and for Training, used small Daimler Scout Cars, larger Daimler Mk.1 and Mk. 2 Armoured Cars, also the American larger Staghound Armoured Cars. 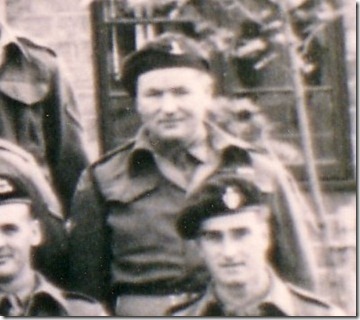 I was an Armoured Car Driving Instructor there from 1945 to 1947. Norman (Taffy) Johnston. Ex 11th Hussars PAO. Regarding cap badges, It was mandatory that if an 11th Hussar was at Barnard Castle during 1944 cap badges must be worn at all times. Some photo’s for you showing four Cherrypickers wearing the badge. Norman Boyd, who runs a blog on Frank Bellamy, contacted us to ask if Leslie Palmer remembered a room in the camp that was highly decorated with pictures of WWII Nazi aircraft. Bellamy was told to create a resource to assist soldiers in becoming familiar with recognizing aircraft. At Deerbolt camp (now a Youth Offenders institution) he spent six months painting the walls and ceiling of an ‘aircraft recognition room with every aircraft in use - RAF, USAF and Luftwaffe […] from every angle imaginable’ (his quote from an interview). He was awarded the ‘War Office Good Service Certificate by the Chief of Imperial General Staff for artwork produced’ and he was given a note by Colonel Wadham congratulating him on his work for the aircraft recognition room. I would guess after the end of WWII it would be gone, but might still have been there in 1946.